I am riding in the 2016 Pan-Mass Challenge (PMC) to raise money for Dana-Farber Cancer Institute in Boston, Massachusetts. Dana-Farber is one of the leading cancer research and treatment organizations in the world. 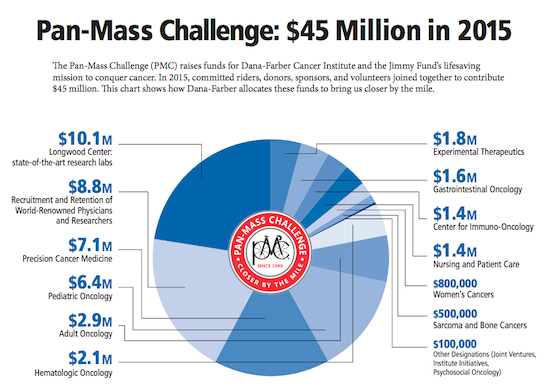 Last year’s Pan-Mass Challenge raised $45 million for Dana-Farber, and the graphic below illustrates how the money helps Dana-Farber and its Jimmy Fund. This year, I am riding the 2-day 163 mile route from Wellesley, Massachusetts to Provincetown, Massachusetts. My fundraising goal is $10,000. With your help last year, we raised over $8,300! It won’t be easy to raise $10,000, but I know I can do it with your support. I want to say THANK YOU in advance to those of you who are able to help me achieve my fundraising goal. You can donate to my fundraising page by visiting PMC.org. Listed below, are this year’s generous donors so far. I would love to add you to this list, regardless of how much you are able to contribute. I will keep a running tally of domain industry donors as a way to say thank you!